Speaking on state TV, Mr Jammeh cited "abnormalities" in the vote and called for fresh elections. The US "strongly condemned" Mr Jammeh's statement. Mr Barrow, a property developer, is due to take office in late January. Mai Ahmad Fatty, the head of his transition team, told Reuters they were "consulting on what to do", adding: "As far as we are concerned, the people have voted. We will maintain peace and stability and not let anyone provoke us into violence." Yahya Jammeh appeared on state TV brandishing a document supposedly proving irregularities when the votes were tallied last week. Mr Jammeh said the results were unacceptable. He said figures had been transposed swelling the number of votes in favour of his opponent, Adama Barrow, whom he recognised as president-elect live on television after the election results were announced. 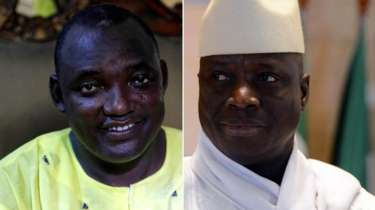 Yahya Jammeh called for a fresh vote. Over the past week people have been celebrating the end of his 22-year-long rule but tonight The Gambia's future looks uncertain again.